End-to-end graphic design, production, and printing with high-quality results. 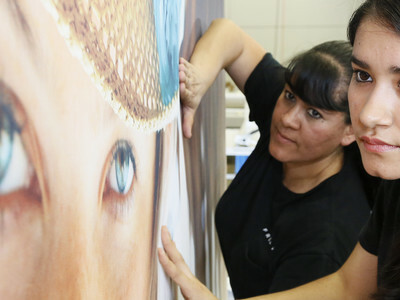 With hundreds of graphics professionals and printing facilities around the world, there’s no graphic we can’t create. It's always been our goal to help our clients look their best, whether it's through an individual piece of marketing collateral or seeing your brand come to life on large-scale digital displays. As technology evolves and new printing methods emerge, we continue to invest in cutting-edge graphic equipment so we can continue to offer clients the latest and greatest options. We draw from a diverse variety of perspectives and backgrounds to offer full-service graphics production. We can print on a variety of materials and produce graphics of any size. No request is too small. And no off-the-wall idea is too daunting. Whether digital or in print, we’ll communicate your content visually on banners, signs, or displays. What’s more, we manage all graphics production in-house. This ensures color management control, quality control, efficiency, and speed. Our team is involved along every step of the production process. We not only bring your content to life through beautiful graphic design, but also provide streamlined production with high-quality results.